The Le Sigh: Premiere: Romantic States - "Ronnie"
Premiere: Romantic States - "Ronnie"
Romantic States tackles nighttime anxiety on "Ronnie." You can practice all of the self-care on the planet, but anxiety can still find a way to sneak up on you. No one's immune from the panic that loves to manifest at the most inopportune times, especially when you're trying to fall asleep. You can innocently be drifting off when a laundry list of stress starts zipping through your brain. Did I finish everything I needed to do at work? Did I say something stupid today? What am I doing with my life? There's no better time to ponder existential dread than the middle of the night, right? On "Ronnie," minimalist rock duo Romantic States tackles this familiar experience and turns it into hypnotizing poetry. Jim Triplett and Ilenia Madelaire are the Baltimore-based pair behind Romantic States, and have been one of our consistent favorites since back in 2013. The duo have been putting out music and showing up at both house shows and massive theaters for almost a decade. "Ronnie" is the second single from the upcoming LP, Corduroy in Italy, which will be out on Gentle Reminder Records in May. "Ronnie" has Madelaire taking lead on vocals, calmly translating late night fears over a repetitive drum beat. "What have I done to regret this / ...it's the devil / I'm the devil / I care," she thinks outloud to herself, as if she's attempting to exorcise what haunts her through song. Listen to "Ronnie" below and keep it under your pillow for the next time you find yourself contemplating life at 2 a.m.
"It's about waking up in the middle of the night with crippling uncertainty." 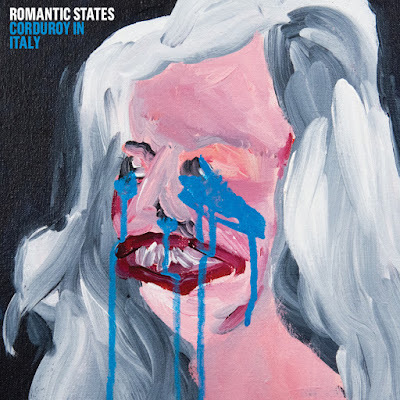 Listen to Romantic States on bandcamp.